Ensuring mobile connectivity in the whole of France, and particularly in the country's more sparsely populated areas, is one of Arcep's top priorities, and reaffirmed during its strategic review as one of the four pillars of its actions. To this end, Arcep works to ensure that operators meet their 2G, 3G and 4G network rollout obligations. In Q1 2016 Arcep thus created a scorecard on mobile network rollout obligations in sparsely populated areas, and today is publishing the latest update. All of the information, which is available as open data files, along with the interactive scorecard is available online at: www.arcep.fr/zones-peu-denses. N.B. : Arcep will publish its next scorecard in September 2017, which will include an update on operators' compliance with the 3G coverage deadlines for town centres set for 30 June 2017. The scorecard provides an update on a series of obligations assigned to operators. These obligations were set out either in the government "town centre white spots" programme or in the terms of operators' 4G frequency licences. Regarding 2G coverage (voice and texting services), 92% of the town centres in the programme have been covered. The vast majority of the remaining locations are waiting for public authorities to install a tower to ensure their coverage. Meanwhile, operators still need to deploy their network equipment in four town centres, including three where they are reporting ongoing difficulties in installing towers. 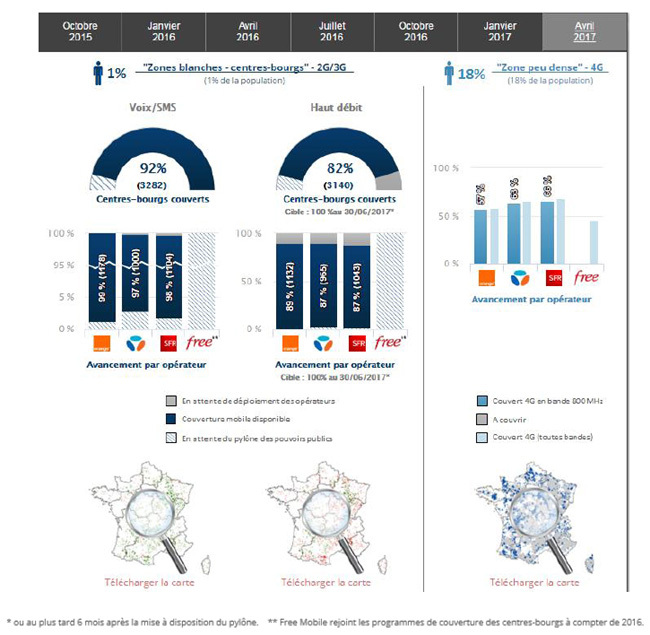 Regarding 3G (high-speed mobile), coverage levels continue to improve: over the last quarter, Orange increased its coverage of the town centres for which it is responsible from 79% to 89%, SFR increased its coverage from 76% to 87% and Bouygues Telecom from 84% to 87%. Operators need to continue their rollouts to ensure their completion by 30 June 2017, in keeping with their obligations, as stipulated by law. The frequency licences issued to operators carry specific coverage obligations for France's sparsely populated zone, which is made up of more than 22,500 rural municipalities representing 18% of the country's population but 63% of its land mass. Operators that have a 4G licence in the 800 MHz band (Orange, Bouygues Telecom and SFR) were required to cover 40% of the population in this sparsely populated zone, using the 800 MHz band, by 17 January 2017. As of 17 January 2017, Orange, Bouygues Telecom and SFR all reported that they had met this obligation. In the first quarter of the year, Arcep carried out tests in the field to ensure that each of the three operators had indeed complied with their obligations. The Arcep body responsible for settling disputes, legal proceedings and investigations ("RDPI") ascertained that Bouygues Telecom and SFR have satisfied the obligations set forth in the pre-emptive formal notices they were sent and which were made public in 2016, and decided to make this information public. Because it has no 800 MHz-band licence, Free Mobile is not subject to this same obligation. It is, however, required to provide 4G coverage to 50% of the population of this same zone, using the 700 MHz band, by 17 January 2022. In addition to satisfying these obligations, operators have continued to build out their networks in these areas. 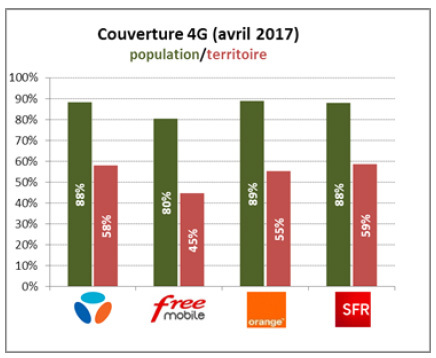 As a result, SFR, Bouygues Telecom, Orange and Free Mobile are reporting 4G coverage, using the 800 MHz and other frequency bands, of respectively 68%, 66%, 58% and 45% of the population in this sparsely populated zone as of 1 April 2017. Arcep welcomes these results. These deployments are improving 4G connectivity in the remotest corners of France, in addition to enabling operators to achieve increased 4G coverage nationwide, as of 1 April 2007. Operators are reporting 4G coverage of between 80% and 89% of the population. However, as of today, none provide 4G coverage in more than two thirds of the country. Arcep will thus work to ensure that operators maintain their rollout efforts, so that the maximum number of people across the whole of France can have access to 4G cellular services.